Nokia is not having the best time of it at the moment. Its lack of a good touchscreen platform is negatively affecting the popularity of its product line. Symbian S60 5th Edition – which is Nokia’s current touch capable OS offering, feels like a non touch OS with touch capability added in, where its key rivals Android and the iPhone OS feel like they are made for touch from the ground up. The new ^3 UI set to appear on the N8 could change things, and it is imminent, so we won’t have to wait too long to find out. But the N8 is focussed more on consumers than the business world, and in the business world large screened, touch capable handsets are now well established. 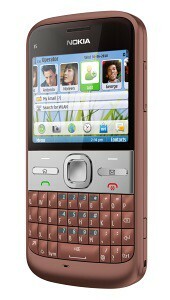 Nokia’s E5 is an attempt to straddle the business and consumer markets via a BlackBerry style device with a mini qwerty keyboard that is ideal for messaging. It is a progression on the much more strictly business focussed E72 and a definite step up from the recently released and purely consumer centric C3. The E5 supports Microsoft Exchange and Lotus Note Traveller as well as ten personal email addresses. Its central claim to being a device you can use for both work and leisure is the reappearance of Nokia’s very clever screen switcher utility. You can set up two completely different home screens with their own wallpaper and shortcuts arrangements, and then flick between them. This means you can have one ‘look’ for work and one for when you are at leisure. The keyboard doesn’t quite match up to the best on offer. The action isn’t as firm as we’d like and there’s no little click as keys go down, but we did get to a fair speed. The screen is fairly small at 2.36 inches, and delivers just 320 x 240 pixels. It is bright enough but lacks sharpness when compared to other higher resolution offerings. It is far from ideal for web browsing, though it is perfectly adequate for mobile email and SMS management. The range of specifications is appropriate for a higher end smartphone with HSDPA, Wi-Fi and A-GPS all present. You have access to Ovi maps for navigation. Social networking makes an appearance with some Facebook integration for seeing contact profiles and drawing down their photos, but there’s no facility to populate the contact book with Facebook – or any other – social networking app contacts. Our limited short term experience with the Nokia E5 suggest that one area in which it can beat large screened, touch supporting smartphones is battery life. We would expect to get a couple of days from it between charges with a fairly mid-range use pattern where most smartphones with touchscreens top out at a day.